순천송광사소조사천왕상은 흙으로 조성한 것으로 송광사 천왕문의 좌우에 2구씩 모두 4구가 안치되어 있다. 사천왕상의 배열은 천왕문의 향 우측으로 비파를 든 북방 다문천왕과 검(劍)을 든 동방 지국천왕이, 향 좌측으로는 당(幢)을 든 서방 광목천왕과 용·여의주를 든 남방 증장천왕이 각각 시계방향으로 북→동→남→서방의 순서로 안치되어 있다. 네 상 모두 의자에 걸터앉은 자세로 전형적인 분노형 얼굴에 머리에는 용(龍) · 봉(鳳) · 화(花) · 운문(雲紋)이 장식된 관을 쓰고 갑옷을 입은 무인상(武人像)이며 각기 오른발은 악귀를 밟고 있는데 비해 왼 발은 악귀들이 받쳐 든 형식을 취하고 있다. 얼굴 모습은 표정이 분노형으로 강한 인상이기는 하나 볼륨감이 뛰어나 입체적인 면이 돋보일 뿐 아니라 다소 해학적인 면도 나타난다. 대형의 상임에도 불구하고 신체 각 부의 비례가 어긋나지 않고 적당하며 부피감과 함께 사실적 기법이 돋보인다. 보물로 지정되어 있는 장흥 보림사 사천왕상(16세기 초반)과 완주 송광사 사천왕상(1649)에 비하여 결코 뒤지지 않는 조형성이 뛰어난 작품이라 하겠다. 이와 더불어 서방 광목천왕상의 지물 중 보탑 대신 새끼호랑이가 등장하는 등 새로운 도상을 보여주어 학술적 자료로서도 그 가치가 크다 하겠다. 송광사 사천왕상은 조선시대 1628년(인조 6)에 다시 만들었다(重造)는 묵서명과 송광사사고(松廣寺史庫) · 사지(寺誌) 등의 자료가 남아있어, 정유재란으로 훼손된 상을 1628년에 다시 만든 것으로 추정된다. 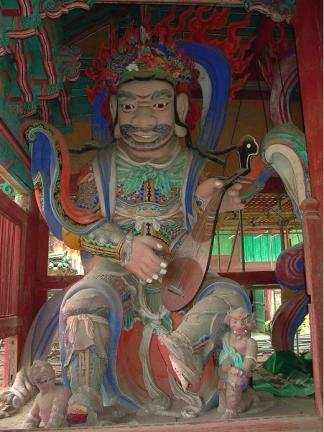 These clay statues of the Four Guardian Kings of Songgwangsa Temple are placed in pairs on each side of Cheonwangmun Gate (the temple gate dedicated to the Four Guardian Kings). The four guardians represent the four cardinal directions, and are arranged in the order of north, east, south and west in a clockwise direction. On the right-hand side of the gate stand the Guardian King of the North and the Guardian King of the East, holding a lute and a sword, respectively, while on the left-hand side of the gate stand the Guardian King of the West, holding a flag, and the Guardian King of the South, holding a dragon and a yeouiju (jewel ball). All four figures are seated on the edge of a chair. They look like noble warriors, each clad in armor and wearing crowns decorated with dragon, phoenix, flower, and cloud designs. Their right feet are depicted crushing evil spirits, while their left feet are supported by evil spirits. They are imposing figures characterized by ferocious looks and large, voluminous bodies that convey a solid weighty presence, yet they appear comical at the same time. Despite their huge size, their physical features are depicted proportionately and realistically. 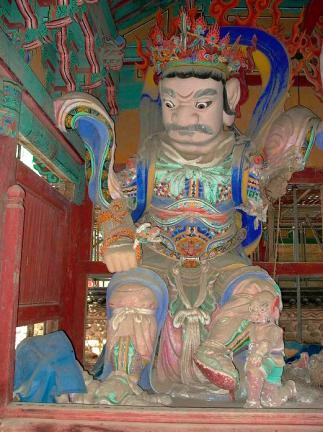 In this respect, the statues reveal a degree of artistic excellence comparable to that of Wooden Four Guardian Kings of Borimsa Temple in Jangheung (c. early 16th century) and Clay Four Guardian Kings of Songgwangsa Temple in Wanju (c. 1649), both of which are designated as treasures. 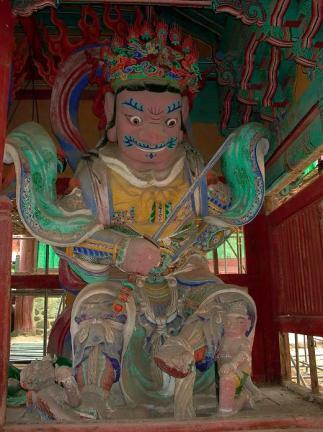 The statues are also of great academic value as they present new images of the guardian kings, most notably that of the Guardian King of the West, who is depicted holding a baby tiger rather than a pagoda. 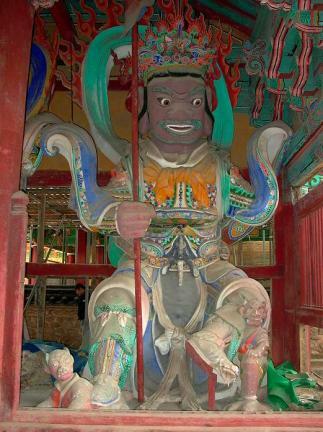 The records and archives at Songgwangsa Temple indicate that these Four Guardian Kings were recast in 1628 (the 6th year of the reign of King Injo of the Joseon Dynasty), suggesting that they has been destroyed during the Jeongyujaeran (the second Japanese invasion of Korea in 1597).